"I want to kill them. I want to kill them all." Sarai is a 12-year-old Nigerian girl whose modest village life is shattered when she is captured by the Ken Jou Plek (Afrikaans for "Know Your Place"), an extremist organization dedicated to the idea that women and girls should be kept down. Like all extremists, the KJP are prepared to realize this vision through torture, slavery, and bloodshed. Certain she is going to die, Sarai makes a bargain with an unusual ally in an attempt to save her life and the lives of her fellow captives. Tragedy, trauma, man's seemingly limitless capacity for cruelty, the frailty of human existence, justice, and retribution are all laid bare in this cutting-edge graphic novel. 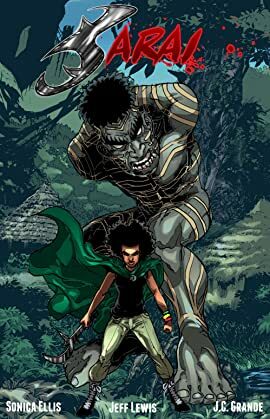 Brutally relevant and emotionally powerful , Sarai fits perfectly alongside such iconic antiheroes as Marvel Comics' The Punisher, Wolverine and Moon Knight and Image Comics' Hit-Girl.